We are all leading increasingly busy lives, and time to cook good food often seems like a luxury! So, when somebody hands you a recipe that is fast, healthy and delicious, it is a gift! I don’t know about you, but there are many pot-lucks in my life; at work and in my various social circles. When work and life are spinning out of control, another dish to cook for a pot-luck can tip the scales. A few years ago when I was feeling overwhelmed by my new job, I was about to gracefully bow out of a staff pot-luck lunch, when one of my colleagues gave me this recipe – what a gift. “Julianna”, she said. “Just make this! It will take you five minutes and then you can attend the pot-luck. Come on!” Well, I did and I have since made it for endless occasions: everyone raves about it and asks for the recipe. So here it is! I hope you enjoy it. Just one note about the salsa: the kind of salsa you use will change the flavour and character of the dip. Experiment with different kinds of salsas to find one you really like. This summer I made it with a tomato/mango salsa and it was to die for! Add rinsed black beans and tomato salsa to the bowl of a food processor and process until smooth and creamy. Add avocado, cilantro, salt (and cheese if using) and pulse 3 or 4 times until these ingredients are just incorporated, but chunks are still visible. Serve with loads of fresh vegetables and your favourite crackers or chips. Thanks for passing on the gift. It sounds like an excellent dip and easy to make too. Have a lovely weekend! You’re so welcome, Liz! If you get a chance to try it, you’ll see why I think of it as a gift. Cheers! 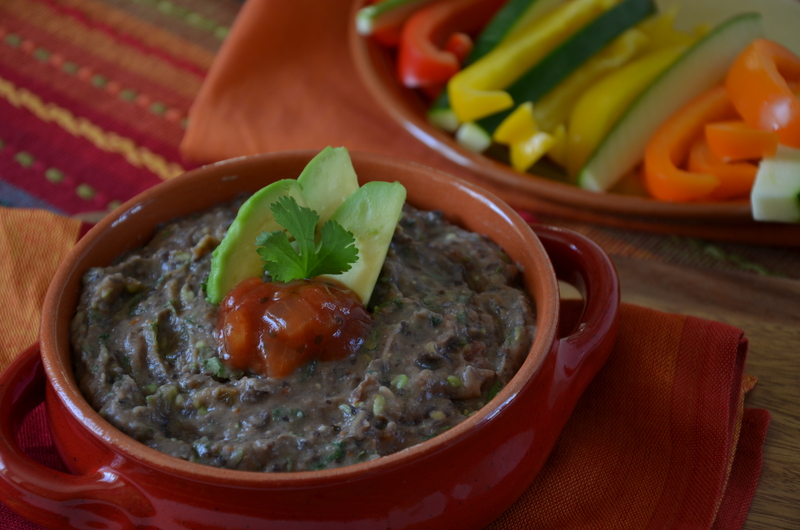 I love black bean dip, this sounds like a good recipe. Thanks for reminding me to make some soon. Thanks Geraldine! I hope you have a good day too!